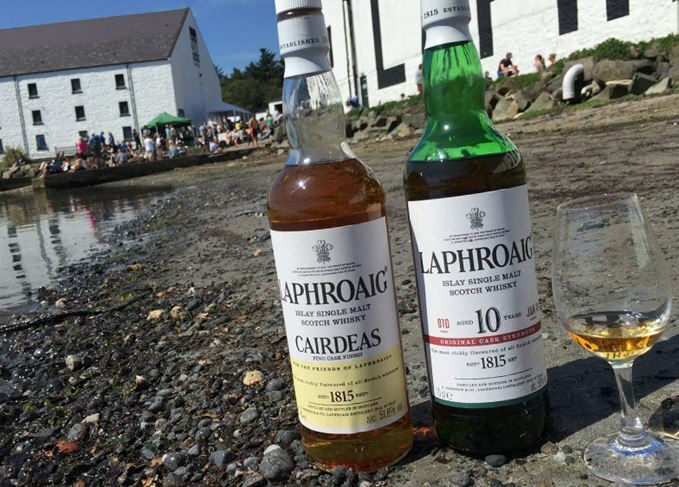 Laphroaig offered one of the more progressive and diverse distillery open days so far, with a zero plastic policy, free samples of its festival release and even a talent show, writes Becky Paskin. When a distillery hands you a mapped guide to its open day activities, you know you’re in for a treat. The queues of excited visitors had formed at the entrance to Laphroaig distillery early on, despite there being no cover charge and plenty of this year’s Cairdeas festival release (30,000 bottles) to go around. On their way into the distillery’s sun-drenched courtyard, visitors were handed a free, reusable aluminium water bottle (an effort to reduce plastic use), Fèis Ìle whisky glass and a bottled sample of the 2018 Cairdeas Fino release. Full bottles were available to purchase from the distillery shop for £81, alongside batch 10 of Laphroaig’s new 10 Year Old Cask Strength – a non-festival bottling timed for release during Fèis – priced at £60. ‘Every year the distillery manager John Campbell crafts a limited edition malt to celebrate the Friends of Laphroaig,’ the mapped guide reads. If this is the way Laphroaig treats its open day visitors, then the brand is sure to make a few more friends for life. Even if guests weren’t interested in taking part in one of the many masterclasses, there was plenty to keep them occupied in the courtyard – live music from a ceilidh band succeeded in dragging folk away from lazy sunbathing to participate in the Gay Gordons, while cocktails, drams, seafood and ice cream kept visitors hanging around for most of the day. You could even get your own bespoke Laphroaig coaster engraved for £4. It’s refreshing when a distillery open day breaks away from the tried and tested formula of standard masterclasses and tours, and offers something a little bit different. This year Laphroaig transformed its filling store into a mini-fête, where for a £15 entrance fee visitors could sample up to four drams from any stall – which included duty free, cask samples, rare finds and cocktails – and even win more whisky in traditional games such as ring toss, bung rolling and peat stacking. Laphroaig also involved a charitable element as well, with some opting to forgo their free dram in favour of donating their equivalent prize to charity. The first ‘formal’ masterclass of the day was hosted by distillery manager John Campbell and brand ambassador Simon Brooking in Warehouse 11, but perhaps formal isn’t the right word to describe a talent show. ‘Islay’s got talent, but we want to see if you’ve got talent too,’ Campbell told the room. The concept involved talented locals such as pipers and Highland dancers demonstrating their skills before members of the audience were selected at random to have a go, with – as expected – comedic results (just watch the video below). The best performers were rewarded with prizes, with the ultimate winner given a bottle of 2018 Cairdeas Fino. Elsewhere, visitor centre manager Vicky Stevens and maltman Arthur Holyoake led a fascinating comparative tasting of four 15-year-old Laphroaig bottlings, including the original, which was discontinued in 2008, the bicentenary release in 2015, Cairdeas 15 and a 15-year-old cask sample made 100% from barley malted at the distillery. About 30,000 bottles of Cairdeas Fino have been produced, available at the distillery and globally to the Friends of Laphroaig, the distillery’s free-to-join membership programme. Matured for about six years in first-fill Bourbon casks before a second maturation in fino Sherry hogsheads, the whisky is bottled at 51.8% abv. The Laphroaig 10 Year Old Cask Strength is bottled at 58% abv, and available for £60. Laphroaig Cairdeas 15 Year Old is reserved for the Friends of Laphroaig collective.